Some of you may have read my book review of René Guénon’s Aperçus sur l’Initiation (“Perspectives on Initiation”) in which I wrote about Guénon’s opinion that there are only two authentic initiative orders in the west: Freemasonry and the Compagnonnage. It was not the first time that I heard about the Compagnonnage, but I never really gave it a second thought. Since I didn’t know what it was exactly, I couldn’t remember the name of this group, so in the end I looked around a bit to get a better idea. It is a not too well known esoteric movement it seems! It is closely related to Freemasonry (as I expected), but almost exclusively French. This is the reason that I hardly found any texts about it in English and all but one who are, are only short mentions of the Compagnonnage in articles about Freemasonry. So, I have tested my French for you and came with this article about a movement that many of you may not be familiar with. First the word. “Compagnon” is in French the same as “companion” in English. A circle of friends so to say. Further it seems that the word “compagnonnage” is nowadays also used for gardening, but I suppose there is a reference to the construction of buildings in history. As the story goes, you will hear many things reminding of Freemasonry. One thing for example is the acclaimed history of the two movements. Both say to have derived from the builders of the temple of Salomon (10th century BC) and both have the myth of the murdered master-builder Hiram Abbif. The compagnons -though- found themselves on three mythological figures that supposedly lived in the same time. First king Salomon who in the Bible (Kings and Chronicles) was told by his father (king David) to build the first temple of the Jews. Second a maître Jacques or master Jacques (his name seems to have become “Jock” in English) who was the architect of the temple (and also of the pyramids of Egypt some say!). Master Jacques had a friend called father Soubise who was second architect. The Compagnons claim a Biblical history, but I haven’t been able to fully confirm that. Hiram Abiff is mentioned in the Bible as Adon Hiram (Kings, Chronicles). Hiram was the builder of the temple of Salomon. Besides being in charge of the building process, he was also the master of the mysteries and therefore initiator. Under Salomon’s temple was a secret temple for the initiated even when the building of the ‘real’ temple was still in process. As knowledge brings envy, three students who were regarded unfit for initiation made a plan to get the password from Hiram. Holem, Sterkin and Hoterfut killed Hiram either or not with the obtaining of the password. Salomon changed the password for certainty and the three were punished. In Kings and Chronicles there are no names resembling these of Jacques or Soubise. There are a few names in Chronicles vaguely reminding of “Jacques”, but no real candidates for this Compagnonnic figure. The same goes for Soubise. There is one “Sobab” who is the son of David, but I am sure that it would have been mentioned if Soubise were the son of David and therefore the brother of Salomon himself. No real solutions here either therefore. Jacques and Soubise are told to be friends and working together as architects on the temple. Somewhere in the process the two got arguments and eventually a real fight. Apparently already then there were different workers (and different mysteries) headed by Jacques and Soubise and their men got very hostile towards each other and the enemy-master. Followers of Soubise even killed Jacques. 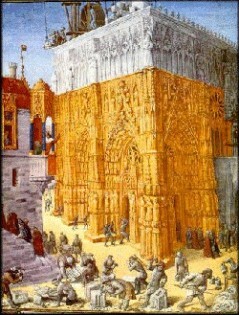 Even today there is a pilgrimage to the grave of master Jacques comparable to the Muslim pilgrimage to Mecca. Every Compagnon has to undertake the journey at least once in his life. These pilgrimages are held on 22 July. It is also said that the followers of Jacques from then on started to wear white gloves (a sign of innocence of his death) and aprons, which we of course know from the Freemasons too. As said the spiritual development seems to have been in line with the ‘worldly’ development, the kind of work. In the underground temple were the two well-known pillars called Jakin and Boas which were the respective passwords for the apprentices (headed by Soubise?) and qualified workers (the men of Jacques?). Anyway, continuing the line of building-guilds, there are said to have been associations of builders in the time of the Greek worship of Bacchus. There were priests called “Dionysians” who also had associations for the building of temples. Also in Rome in 797 BC there is said to have been a high school for architecture and building (the “collegia artificum”). Similar associations have existed ever since. A big jump in time takes us to a more imaginable period, the 12th century. It is said that in these times various guilds were formed in different forms of labour. These were groups of people in the same occupation and of course we know this story from Freemasonry as well. These last claim to be descendents from the guilds of stonemasons (builders, so to say) which is called the practical (“operational”) period, while later there came a more theoretical (“speculative”) masonry. Anyway, according to Compagnonnic sources there is definite prove of their early guilds in the 12th and 13th centuries. In Christian sources there are notes of excommunications of certain brotherhoods, such as in the texts of the councils of Rouen (1189) and Avignon (1326), so besides the building of cathedrals these Compagnons must have had other activities. One not so spiritual is trading, or said differently, the workers were for hire, helped out in different places and provided material. I may assume that this is not the reason for excommunication by the church of Rome though! It is said that somewhat later that guilds of people were founded that were so to say involved in the protection of legal rights of the workers and what we would now call insurances. Such people often were not workers themselves but had other skills. Herein we can see a start of the shift to a more non-practical masonry. In the guilds there were already three grades of workers: servants, apprentices and masters which names speak for themselves and are of course easily linked to the three-grade systems from Freemasonry, the so-called “blue grades”. It is also this time that according to some sources the esoteric tradition from the West shortly flowed aboveground for a while. The well-known Knight Templars came in contact with different religions and cultures and allegedly also esoteric (Islamitic) orders during their crusades. The Templars supposedly were a genuine link in the chain of the Western esoteric tradition. No wonder both the Freemasons and the Compagnons make this to their second version of the history of their orders. Maître Jacques could now become Jacques de Molay, the last leader of the Templars who was executed in 1314. There is a similar second version for father Soubise. He would have been a high-ranked Cistercian. The Cistercian order was closely related to the Knight Templars and it is the Cistercians who taught the builders of temples the art of sacred geometry. The order can be called a neo-Benedictine order that seems to have been not only religious and military, but also concerned in construction-works. The order was founded in 1098 and had a big influence in medieval Europe. Supposedly it were the Cistercians who converted the Templar-order to some mystery-organisation. Another myth concerns the split of the original Compagnonnic movement in three divisions. Either in 1267 or around 1400 the split occurred with the building of the great towers of the cathedral of Orleans. There were two architects at work that are named Jacques de Moler and Antoine Soubise. Little can be said about the authenticity of this story. The names are far too convenient. This story is often used to explain the origin of the three orders of Compagnons. The “children of Salomon” claim to descend from Salomon and being the original order, the “children of master Jacques” and “the children of father Soubise” didn’t exist before the schism and are spin-offs. A point can’t be left unnoted is the following. In Kings V the Bible speaks about the building of the temple and King Salomon. Already then there were three kinds of workers: carriers, builders and leaders. Naturally the Compagnons use this for their Biblical history which differs from the ‘historical’. But to shortly come back to the three divisions, “The children of Salomon” (or ‘compagnons of liberty’) say to have been the builders of the temple that replaced the mobile tabernacle for the Jews. In later days there were the builders of the gothic cathedrals. “The children of Master Jacques” are also known as the “Compagnons Passant” (‘incidental compagnons’?) and “Companions de Devoir” (or ‘compagnons of duty’) who were later mostly concerned with the building of bridges. The third are of course “the children of Father Soubise” who were later responsible for the construction of ecclesiastical buildings in the Romanesque style. The alternative names are quite confusing by the way, I will shortly speak about this later on. In the 16th century there seem to have been quite some meetings of Compagnons, but now even the crown interfered with the situation. Meetings of Compagnons were forbidden while before everything happened under royal authority. After a short period of no Compagnonnic activities, the Compagnonnage was rediscovered and then a rapid growth took place that seemed unstoppable. In the 17th century the Compagnonnic meetings were formed to secret societies and old and new customs were introduced. While rebelling against their suppression, the Compagnons got involved in the religious conflicts of the time of the French Revolution. The “Gavots” or “children of Salomon” were accused of supporting the reformation and the “Dévoirants” or “children of master Jacques” were said to rebel against the Catholic church. In 1665 the Vatican saw the growing problem of the order, so Compagnonnic activities were forbidden again, since also in 1539 this had happened. Things didn’t get any better after this, but the upcoming of the Compagnonnage continued in spite of all problems. An interesting statement about this time is the following: “All the professions had their compagnonnage”. Not only builders, but also carpenters and even tailors, barbers, saddlers, roofers, etc. had their ‘Compagnonnage’, all with different rites and sacrileges. This seems to imply that the guilds of virtually every profession also had an esoteric or religious side and that all had some kind of connection. Also in the Compagnonnage of today there are sometimes lists of different kind of Compagnons named after a whole range of professions. And when many workers were involved in ‘esoteric labour-unions’ the Compagnonnage must have definitely been a large movement in this time. After the problems the movement thought that it was time to get things together, make a clear statement to the outside world and especially within their own ranks. It is in the 17th century that the rules and rites are written down and the Compagnonnage became an initiative movement in the sense that we understand this word today. Also in this century and the 18th a great many new Compagnonnic groups were formed, bringing the number even higher than before. In 1791 there were as many as 27 professions with a Compagnonnic organisation. To give you an idea of their variety, I will give you a few names: saddlers, carpenters, rope makers, roofers, marshals, barbers, smiths and butchers. Then on to the early 20th century. There are three main movements to be recognised within the order that by this time are not so hostile towards each other anymore. These three are “les Compagnons du Devoir” (the compagnons of duty), “les Compagnons du Devoir de Liberté” (the companions of liberty) and “l’Union Compagnonnique des Devoirs Unis” (the compagnonnic union of white duty). There were attempts to regroup these three, but even after spending 30 years to this, the result was nil. Also during the 20th century the attempts to get the different Compagnonnic groups more on one line continued. Until today the Compagnonnage claims to be an umbrella-organisation for various guilds of handcraft-workers in the building-sector, but also industry and bakers and the like. Large works are said to have been by Compagnonnic hands, like the building of the Eiffel tower, the restoration of the Arc de Triomf and such. However still mostly to be found in France, there are also Compagnons in Belgium (especially Brussels), Germany (where the ‘European’ order the “Confederation Compagnonnage Europèen” (C.C.E.G or ‘european confederation of the compagnonnage) or in German “Rechtschaffen Fremde Handwerkgesellen” (or ‘honourable society of strange handworks’) can be found), Scotland and Canada. There are even discussions to allow women to join! A few words about the rites and rituals of the Compagnonnage today. As said these differ from group to group, but all groups have in common that there is a hierarchy under their members and the rites to go from one grade to another are of the same structure. They do differ from group to group, because they involve tests in skill in the profession where the candidate works in. Also involved are physical and moral tests. These three tests make the group more of a unity. Like in Freemasonry there are also codes, handshakes, etc. to recognise fellow Compagnons. Further there are welcome- and goodbye-rites and funerary-rites. Every year large meetings are held to consolidated the group feeling. It is attempted to also do this between different Compagnonnic groups, but not always with the result some people hope for. The hospitality never went totally away. But of course most rites are performed during meetings in the temples. Every profession has its patron saint, for the carpenters for example this is Joseph. The rites involve masks, sticks and ribbons. I know the sticks from the Masons, but not the other two. The ribbons that are attached to the hats have different colours according to the group and profession and also the way they hang differs (on the back, over a shoulder) and the numbers differ. Of course the number of ribbons and their colours are symbolic. The collective meal and drinking is also of importance. Each group has it’s own drinking-canes that are decorated with colours and the Compagnonnic symbols such as the compass and the t-square. Further every member has a symbolic nickname. I may assume that these names are given after initiation. Other symbols that are often used and seen in buildings made by Compagnons are enclosed hands, canes, cross, labyrinth, dog, bees, flowers. I suppose that these symbols are also used in the rituals. This is about what I have been able to find and understand from various texts about this movement. As said most texts were in French, and my French is not exactly comparable to my English. Still I hope to have given you an idea about this not-too-well-known but in France still pretty large group. A strange history with many internal quarrels, but not resulting in as many splits as with Freemasonry for example. What makes the Compagnonnage and Freemasonry genuinely initiative, I don’t know, but of course I don’t really know either group. Book in English reviewed in the book reviews section. If you want to look for information in English, I am afraid that you will to do with the information above. Further I suggest the official Compagnonnic page with a lot of information in French www.compagnonnage.org and other pages in French like www.compagnons-du-devoir.com with many info and links, www.compagnons.org, a nice-looking and informative page. Many images you can find on the website of Levourch. When looking with Google or so, you will find more pages, but most are in French. You have been using three of my pictures in this very page for a long time, “without explicit persission” ( your own terms ). You hardly mention the origin of these three photos, only by a link hidden behind the work “click” down the page. Could you insert precisely where you took these photos, please. That doesn’t mean I give you my explicit permission. Touché Erwan… It’s not really my style to do things this way. I wrote this article so long ago, that I don’t even know where I got the visuals, but a link to your site and all photos from it, can hardly be an accident. Usually I would at least link to my sources. I don’t know if these links where lost when I changed my website from an html website to a database structure, maybe, maybe I never thought of making more references to your website. Excuse-moi. The photos have been deleted, people who want to see it can just visit your wonderfull website. Dorette, Freemasonry has womens and mixed lodges, which are of course “irregular”. It seems that Le Compagnnage is a comparable, but still different organisation (the “umbrella” I mentioned). I do not know more than I wrote in this old article which contains gathered information from secondary sources, so I cannot help you more than with the half remark I already gave.